People gather outside the Prince Harry pub in Windsor, England. 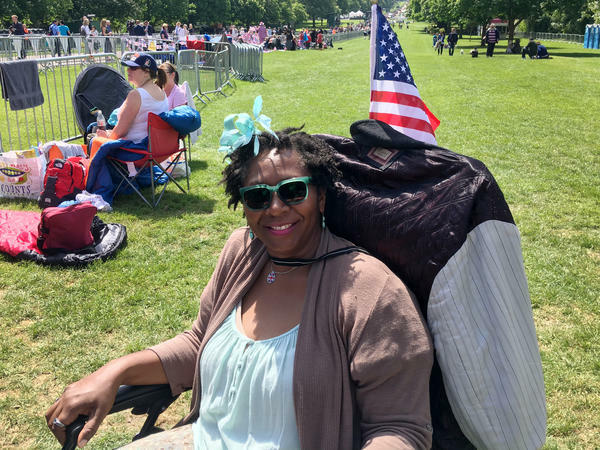 Alison Noel flew in to London from Los Angeles and is spending Friday night sleeping in a lawn chair to catch a glimpse Saturday of Meghan Markle, whom she calls her "L.A. Princess." 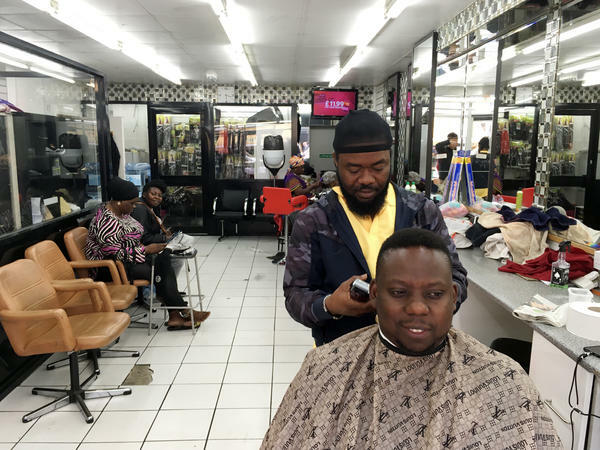 Barber Mike Oke in Peckham, London, is a huge fan of Prince Harry, who's widely regarded as the most approachable of the royals. 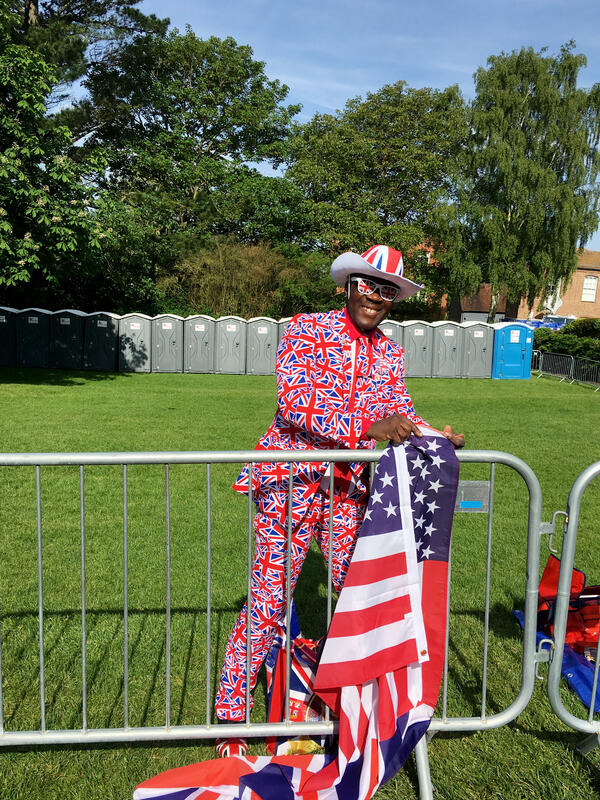 Joseph Afrane, originally from Ghana, is a royal "super-fan" and stakes out a spot on the Long Walk that leads up to Windsor Castle. Royal super-fan John Loughrey, 63, poses in front of a statue of Queen Victoria with Windsor Castle behind. What makes this wedding interesting is not Prince Harry's position. He is sixth in line to the throne and extremely unlikely ever to sit upon it. Instead, much of the focus has been on his unconventional choice in a bride: a biracial, divorced American TV actress. For years, Harry dated from the usual pool of upper-class women. "These girls were always the same," said Kate Williams, a professor of history at Reading University. "They were always British. They were nearly always aristocratic, had a castle or two. They all were blonde party girls." Markle, on the other hand, grew up in Los Angeles, raised by an African-American mother who teaches yoga and is a social worker. That background, so different from the royals, has resonated in parts of London such as Peckham, a mixed-income area south of the Thames River with a big Afro-Caribbean population. Earlier this week, Emma Jones, 40, a civil servant whose father emigrated to the U.K. from Trinidad, sat in a salon having her hair done and talked about what it meant to have the royals welcome someone of black heritage into the family. "If you look at royal history and you look at how things are changing in terms of diversity, the fact that Meghan Markle is going to be married to one of the princes ... that's massive!" said Jones. "At the end of the day, I think it's important for me as a woman of color to be able to identify with the leadership in this country." Royal watchers say that by accepting a self-made woman of color into the family, the Windsors will seem a little more open and a bit more in touch with some of the shifts in the United Kingdom, particularly multicultural London, where more than one-third of the population is foreign-born and 41 percent are black or other minorities. Robert Lacey, a historian who wrote the official companion book to The Crown, the hit Netflix series, says that even as the royals sit atop Britain's social hierarchy, they can't afford to be completely divorced from the trends and changes rippling through society here. "From the point of view of the royal family, it absolutely is the guarantor or perhaps the talisman of their survival," said Lacey. "They have a constant struggle, the British royal family, for all their popularity, to demonstrate their relevance." The family has not always been popular and their problems have gone beyond the usual complaints about how much they cost and how much of anachronism monarchy seems in this day and age. In the 1990s, Queen Elizabeth's image suffered after three of her four children, including Prince Charles, went through divorces. The divorce between Prince Charles and Princess Diana involved infidelity on both sides and became routine tabloid fodder. Following the death of Princess Diana in a car crash in Paris in 1997, the queen came under even harsher criticism, when she took days to come to London to mourn the death of a woman who had resonated deeply with many ordinary Britons. Over the years, the royals have managed a comeback. The queen, now 92 and Britain's longest-serving monarch, has earned respect not only for her longevity, but also for her work ethic and steadfastness. When more than 70 people died in the Grenfell Tower apartment fire last year, the queen visited a center caring for victims, offered words of comfort and appeared on the verge of tears. The display was in marked contrast to Prime Minister Theresa May, who declined to meet victims before the cameras in apparent fear of their wrath. Another reason the royals' image has improved is the queen's grandchildren, who are broadly popular and have put a fresh face on the monarchy. Prince Harry, in particular, has come a long way and many Britons feel as though they've watched him grow up. The image of the young prince walking behind his mother's casket through the streets of London is seared into the memories of most people here. As a young man, though, Harry became a party boy, sometimes embarrassing his family. He was photographed in 2005 wearing a Nazi uniform at a costume party and, several years later, was photographed naked in Las Vegas during a game of strip pool. But by all accounts, Harry, now 33, has matured. He served in the British army in Afghanistan, rising to the rank of captain, and began promoting a most un-royal cause: mental health. He came clean about his own suffering in a podcast last year for London's Telegraph newspaper. "I can safely say that losing my mum at the age of 12 and therefore shutting down all of my emotions for the last 20 years has had a quite serious effect," he said. "All of a sudden, all of this grief that I'd never processed started to come to the forefront and I was like, 'there is actually a lot of stuff here that I need to deal with.'" The weeks leading up to Saturday's wedding have been marked by drama in the Markle family. Her estranged half-brother wrote an open letter to Prince Harry telling him not to marry her. Her father Thomas Markle has decided not to come because of health problems and, according to TMZ, "because he doesn't want to embarrass the royal family or his daughter." There had been some speculation that Markle's mother Doria Ragland would walk her down the aisle in St. George's Chapel. Instead, Prince Charles, Harry's father and the future king of England, will do the honors. Tomorrow morning, millions across the globe are expected to tune in for the royal wedding. There will be the pageantry that the British do oh-so well. As NPR's Frank Langfitt reports, there's another story behind this royal wedding, that of a changing Britain and the redemption of a wayward prince. 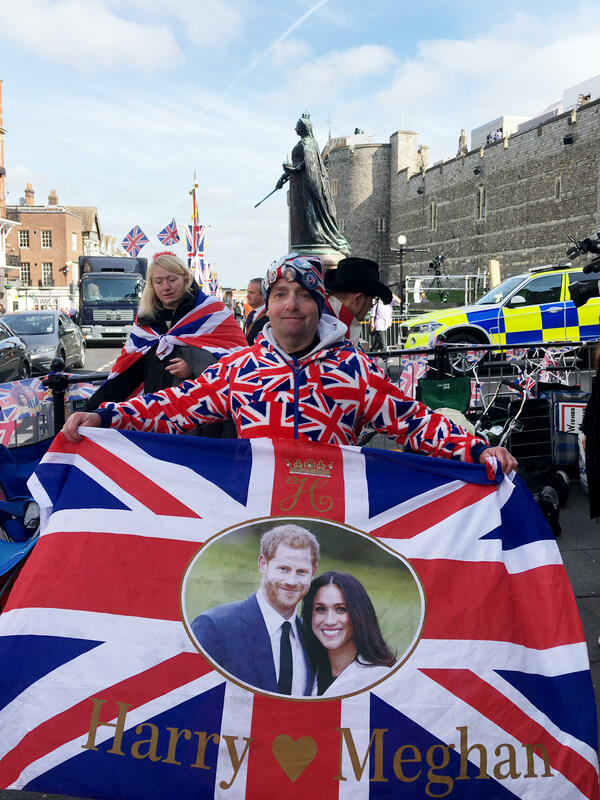 FRANK LANGFITT, BYLINE: This is Windsor Castle, where tomorrow Prince Harry and former American actress Meghan Markle will wed. Now, right now it's a carnival atmosphere on the streets here. Some people have been sleeping out for several days so they can get a view of the carriage when the couple rides by. Harry, though, he's just sixth in line to the throne. And what's been interesting about this wedding is that his unconventional choice of a bride - Markle is biracial and divorced - has kind of struck a nerve in parts of Britain where normally the royals don't really resonate. LANGFITT: Like here in Peckham. It's a mixed-income London neighborhood with a big Afro-Caribbean population. Emma Jones sits in a salon having her hair done. Her dad came here from Trinidad in the '60s. And she says having the royals welcome someone of black heritage into the family means a lot. EMMA JONES: If you look at royal history, and you look at how things are changing in terms of diversity, you know, the fact that Meghan Markle is - you know, she is going to be married to one of the princes, that's massive. At the end of the day, I think it's important for me as a woman of color to be able to identify with the leadership in this country. LANGFITT: Down the street at the barbershop, Mike Oke says he's especially interested in the wedding because he loves Prince Harry, who, along with the queen, is one of the most popular royals. Oke sees Harry as cool and approachable. MIKE OKE: He's wicked, just like - it's a free air. It's like a wind. It blows, cool you down. If you're upset, it cools you down. Harry's - he's fun guy. LANGFITT: Prince Harry has come a long way. He lost his mother, Princess Diana, in a car crash in Paris when he was just a kid. As a young man, he loved to party but sometimes embarrassed the royals. LANGFITT: But by all accounts, Harry, who's now 33, has grown up. He served as a soldier in Afghanistan and began promoting a most un-royal cause, mental health. He came clean about his own pain on a podcast last year for London's Telegraph newspaper. PRINCE HENRY WINDSOR: I can safely that losing my mom at the age of 12 and therefore shutting down all of my emotions for the last 20 years has had a quite serious effect. All of a sudden, all of this grief that I've never processed has come to the forefront. I was like, there's actually a lot of stuff here I need to deal with. LANGFITT: The arc of his life seems only to have endeared him more to people here. 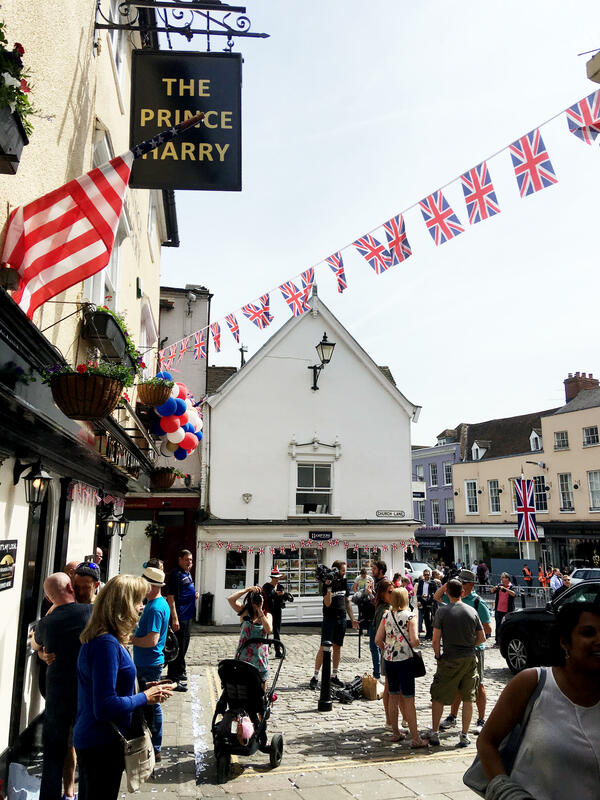 LANGFITT: Mary Brazier is meeting with her neighbors in suburban London to organize a block party to celebrate the royal wedding. Given Harry's past struggles, which include his mother's disastrous marriage to Prince Charles, Brazier says marrying another aristocrat would have made no sense. MARY BRAZIER: It was never going to happen because he has emotions, and he's not interested in an aloof, cold relationship. He wants to live his life. LANGFITT: The wedding plans have been marred by last-minute drama in Markle's family. Her estranged half-brother wrote an open letter to Prince Harry telling him not to marry her. Markle's father, Thomas, has decided not to attend, reportedly because of heart surgery and embarrassment over selling photos to the paparazzi, whom the royal family hate. But that hasn't affected Mary Brazier's opinion of her. BRAZIER: It's normal, isn't it? You've got some embarrassing members of your family. I think it's been sadly sensationalized. LANGFITT: The last two years have been tough here in the United Kingdom. The country suffered a series of terror attacks and remains bitterly divided over Brexit. Tomorrow, some people are just looking forward to the spectacle of a British royal wedding. Frank Langfitt, NPR News, Windsor. (SOUNDBITE OF CASEROLOOPS' "MOVE IT") Transcript provided by NPR, Copyright NPR.